Only if a time machine existed. 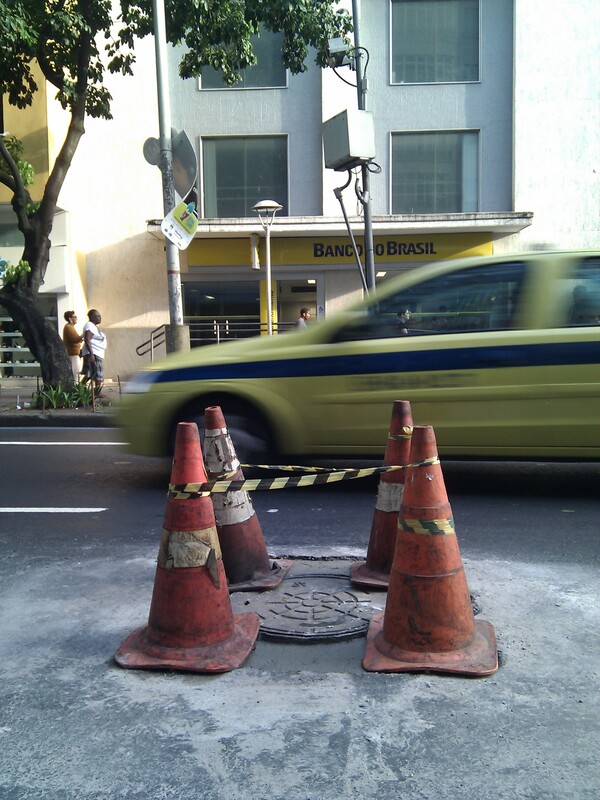 Rio de Janeiro has been busily repaving its streets, as part of the revitalization in the runup to all those mega-events. 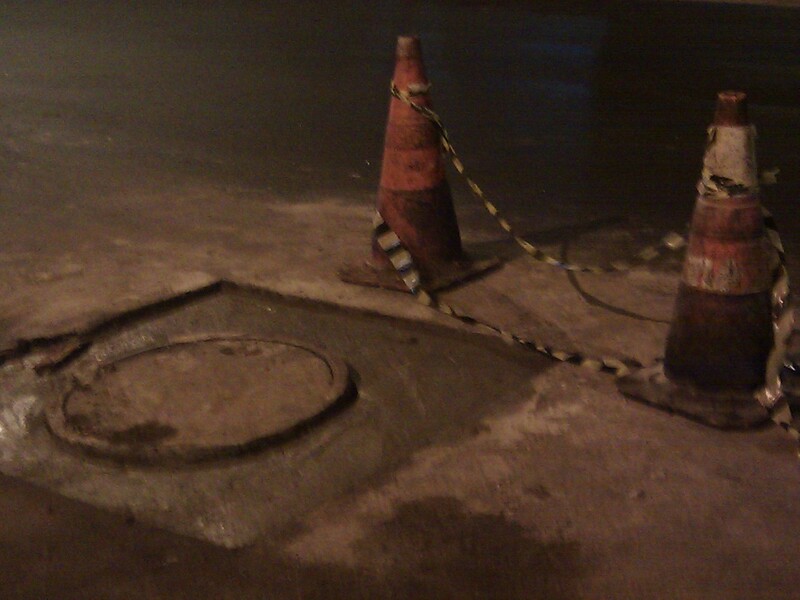 Manhole covers (exploding or not) are a challenge for any city. They end up lower than the newly paved street. Rough edges such as these are rife in Rio, where violence and unrest have returned after a yearlong hiatus. September 2010 saw a wave of motorist robberies (arrastões) that were followed by a crescendo of car- and bus-torchings, culminating with the Army’s November occupation of Complexo do Alemão and Vila Cruzeiro. Then all was relatively calm–until now. Yet what’s surprising isn’t this week’s three-night altercation between Complexo do Alemão residents and the Brazilian Army, or the post-baile-funk attack on the local pacification unit in Cidade de Deus— but that it took so long for violence to resurface. Cariocas are famous for their irreverence and noncompliance but many Brazilians bend easily to authority, or at least hide their misdemeanors. Such is the legacy of slavery. And what’s not surprising are the comparisons being made by some cariocas, between the forces of public order and the forces of criminal dominion. “At least when the drug traffickers ran things, we knew the rules,” favela residents have been heard saying. This, in a society as authoritarian as Brazil’s, is but a a variation of “Things were so much better when the military were in power”, often repeated after 1985 by those fearing the forces unleashed by democracy. And unleashed forces–not the evils of repression– are what this story is all about. For what pacification– with its many faults— is doing is to integrate the formal and informal territories of Rio de Janeiro. Integration is part of a long-term irreversible trend in Brazil. The country’s poor are bursting through the doors of a party heretofore restricted to those with connections, blessed with a silver-spoon knack for the jeitinho, the hallowed improvised solution to the conundrums posed by a bureaucracy meant insidiously to function as a socioeconomic barrier. Lula’s 2002 election was a clear sign of the trend, and he helped the process along. Those who think that pacification is just another zig in a long public policy history of zigzags of ignoring favelas and then cracking down on them, or that drug traffickers and militia members will win out, could be practicing a perverse form of wishful thinking. Census data show that almost forty million people came into the middle class in the last eight years. This means fewer folks to boss around, and more to compete with. It means doing your own laundry and studying hard. New behavior is the order of the day for all: army, police, favela residents, traditional middle class members, the elite, politicians, business, and many more. [ Pacification] is a process of reciprocal education: security forces and the community. It’s a daily learning process. There are still vestiges of the bias of a violent apparatus, in the case of the security forces, and of the culture of parallel power, in the case of the communities. But this is a minority. It’s an endless learning process and it will improve each day. The speaker is Governor Sérgio Cabral, last Tuesday. He may be mixed up in questionable friendships and finances, and he may have done an incompetent job of managing labor issues, but the statement shows intelligence and a rare appreciation for the complexity of carioca life. This week, a seminar to evaluate the police pacification units was scheduled, with initial participation by security agents and later participation from community members. A recent opinion survey among residents of favelas with pacification units has found significant support, despite problems. The growing middle class (some of which can nowadays be found in favelas) is part of a global trend. Rio can certainly thank the Olympics and the World Cup for its makeover, but the writing was already on the wall: no more can a city or a country practice socioeconomic apartheid. As indicated by a video of the first of three nights of violence in the Complexo do Alemão, uploaded to YouTube, millions of people now have the technological capability to expose their world to everyone else. Do a search on YouTube for “Complexo do Alemão” and you’ll find no fewer than 5,330 videos. Try ignoring those. According to RioRadar blogger Andrew Fishman, the initial occupying force, comprised of Haitian shantytown patrol veterans, was recently replaced by less experienced troops. The video linked above shows initially uncertain and hesitant Army soldiers, who ended up shooting rubber bullets and lacing residents with spray. Four soldiers have been taken off duty and there will be an inquest. It’s not clear what’s been happening in Alemão. O Globo gives credence to the Army’s and state Public Safety Secretariat’s view that drug traffickers are instigating locals to violence against the Army, as a reaction to a crackdown on illegal sales of bottled gas, supposedly a new business for former drug traffickers. Officials had also just announced that the Army will stay until June 2012, instead of leaving next month. Others say Alemão residents are truly tired of being occupied, of being searched and suspected and ordered around. Perhaps there is truth in both versions. Maybe both sides are adjusting as rules, behaviors and expectations change. Democracy is, after all, a process of organizing, presenting, weighing and meeting or denying demands and interests. It isn’t unblinking obedience to a higher authority, either drug trafficker or general. Meanwhile, police shootings of civilians have dropped dramatically in pacified neighborhoods, narcotraffickers and militia members are being arrested and many crimes are falling all over Rio, though there have been some frightening exceptions such as this and this and drug trafficking still exists (in what city doesn’t it?). Militias do, too. 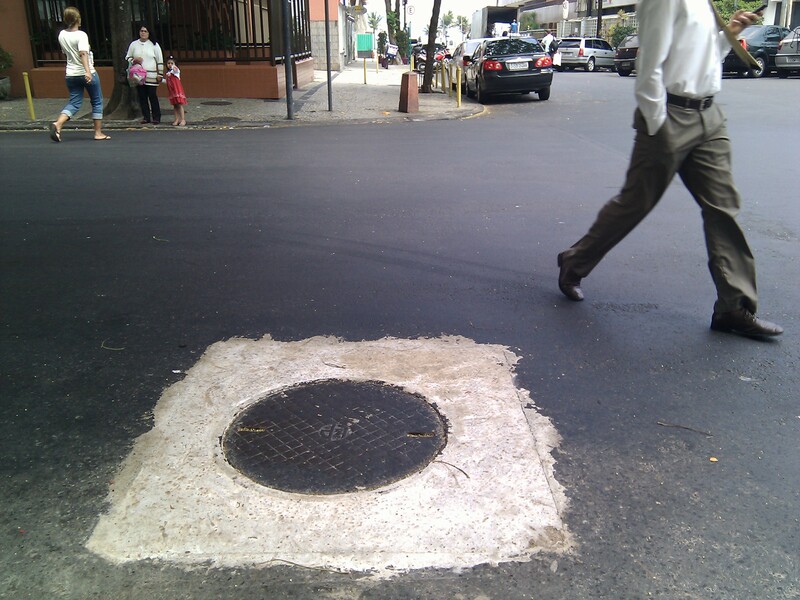 Though it’s possible to install a recycled-rubber riser on a manhole cover to get a smooth street, the carioca crews seem to have taken a cue from local manicurists, who messily splash nail enamel all over your fingers and then clean up the excess with cotton wrapped on a stick, dipped in remover liquid. In contrast, Vietnamese manicurists do the painting as if walking a tightrope, saving on nail polish and remover, both. The just-so Vietnamese may not have much to contribute to Rio’s public safety pacification policy, implemented in 2008 and up to eighteen favelas now, out of a planned total of at least forty by 2014. With only a few countries to serve as models and a plethora of actors and variables whose behavior can’t be fully predicted or planned for, the process is necessarily as bumpy as Rio’s long and troubled Avenida Brasil– which hasn’t yet been fully repaved. This entry was posted in Brazil, Transformation of Rio de Janeiro / Transformação do Rio de Janeiro and tagged 2016 Olympics, Brazilian Army Complexo do Alemão, Complexo do Alemão, crime Rio de Janeiro, José Mariano Beltrame, militia, pacification Rio de Janeiro, public safety Rio de Janeiro, Rio de Janeiro revitalization, Rio de Janeiro transformation, UPP. Bookmark the permalink. 1 Response to Rio pacification at risk? Thanks for a thoughful and interesting article. It made sense to me. To the authorities I would suggest the following: everybody SHOULD know what the rules are — both the people and the cops should know — and the cops should do their part by following those rules. I am not sure what the rules are. In the US it is simply illegal to stop and search someone without a good reason. I would object if I were stopped in my middle-class neighborhood in Rio and searched without a definite justification.